Cook County board president Toni Preckwinkle proposed a county tax on guns and bullets as part of the 2013 budget Thursday. The tax would charge an additional five cents for every bullet sold and an additional $25 for every gun sold. Preckwinkle presented the proposal in an effort to earn more money for the county amidst a significant deficit and as a way to stem a recent apparent increase in gun violence. Larry Suffredin, the Cook County commissioner for the 13th district, which includes Evanston, sponsored the tax. The revenues can recoup some of the county’s costs of gun-related incidents, Suffredin said. 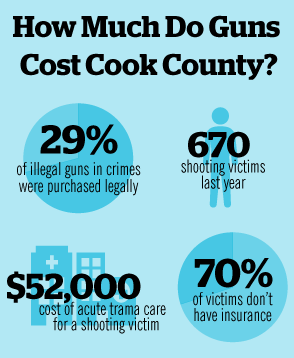 Suffredin said gun violence has a significant impact on Cook County hospitals and courts. On average, acute trauma care for a shooting victim costs $52,000, Preckwinkle said in her budget address. According to the county board’s budget recommendation, the gun and bullet taxes are estimated to generate $1 million in the 2013 fiscal year. The recent shooting death of 14-year-old Evanston Township High School student Dajae Coleman brought attention to the issue of gun control in Evanston. “The violence in Cook County is devastating and the wide availability of ammunition only exacerbates the problem,” Preckwinkle said. In Chicago, 30 percent of guns used in crimes were initially purchased from Cook County gun shops, said Colleen Daley, executive director of the Illinois Council Against Handgun Violence. The Illinois State Rifle Association, however, has voiced strong opposition to the tax. Richard Pearson, the association’s executive director, said the tax would drive gun and bullet sales outside of the county. Pearson added that the tax would also punish law-abiding gun owners instead of those responsible for gun violence. Suffredin said the tax will create a rift between lawful gun owners and gang members. “It’s lawful gun owners who buys these guns originally and then somehow get them to the gangbangers. What we’ve got to do is put obstacles in their way,” he said. If the tax passes, Pearson said, the ISRA will consider filing a suit against the county. Suffredin said there’s enough support on the board for the gun and bullet tax. “I don’t think we’re putting any kind of a burden on any legitimate citizen, and the State Rifle Association will fight anything because they really don’t care about humanity,” Suffredin said. The 2013 budget will be open to several public hearings as well as departmental reviews before the final version is passed Nov. 16.